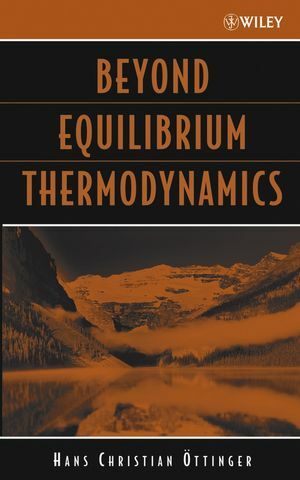 Beyond Equilibrium Thermodynamics fills a niche in the market by providing a comprehensive introduction to a new, emerging topic in the field. The importance of non-equilibrium thermodynamics is addressed in order to fully understand how a system works, whether it is in a biological system like the brain or a system that develops plastic. In order to fully grasp the subject, the book clearly explains the physical concepts and mathematics involved, as well as presenting problems and solutions; over 200 exercises and answers are included. Engineers, scientists, and applied mathematicians can all use the book to address their problems in modelling, calculating, and understanding dynamic responses of materials. HANS CHRISTIAN ÖTTINGER is Professor of Polymer Physics and a former chairman of the materials science department at the ETH Zurich (Swiss Federal Institute of Technology). He has over two decades experience as a teacher and researcher in physics and polymer science. In addition, he holds memberships in the American, British, and German Societies of Rheology, the German Physical Society, and the Swiss Rheology and Polymer Groups. He also serves on the editorial boards for Applied Rheology, Journal of Rheology, and Multiscale Modeling and Simulation. 7. Kinetic Theory of Gases. Appendix A: Crash-Course on Equilibrium Thermodynamics. Appendix B: Mechanics and Geometry. Appendix E: List of Applications of Beyond-Equilibrium Thermodynamics. Appendix F: Solutions to Exercises.